At the Objects to Restore step, choose data that you want to restore. Click Add and browse to the file or folder, or NDMP volume you want to restore. The selected item will be added to the list. To quickly find file, folder or volume, use the search field at the top of the list: enter an object name or a part of it and click the search button on the right or press [ENTER]. If you have chosen files to restore in the Files view, the list of objects to restore will be populated with selected files. For one restore session, you can select only Microsoft Windows and Linux files, or NDMP volumes. 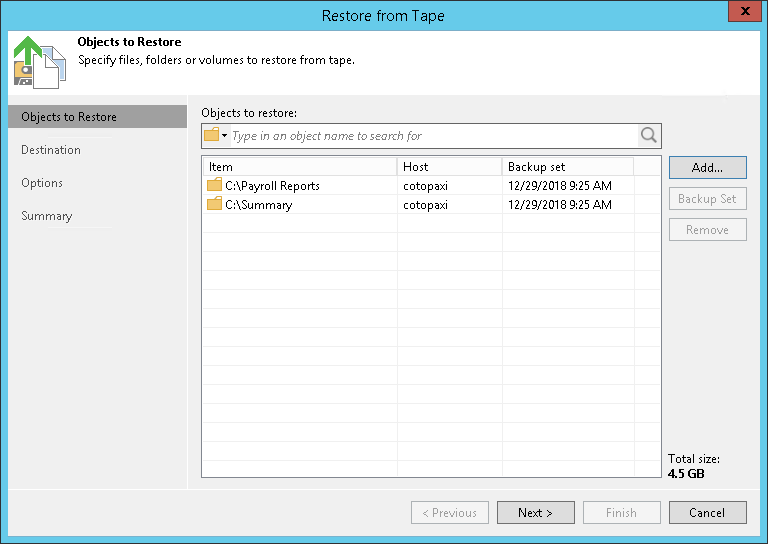 By default, Veeam Backup & Replication will restore the latest version of files available on tape. If you want to restore files from another restore point, select the necessary file and click Backup Set. 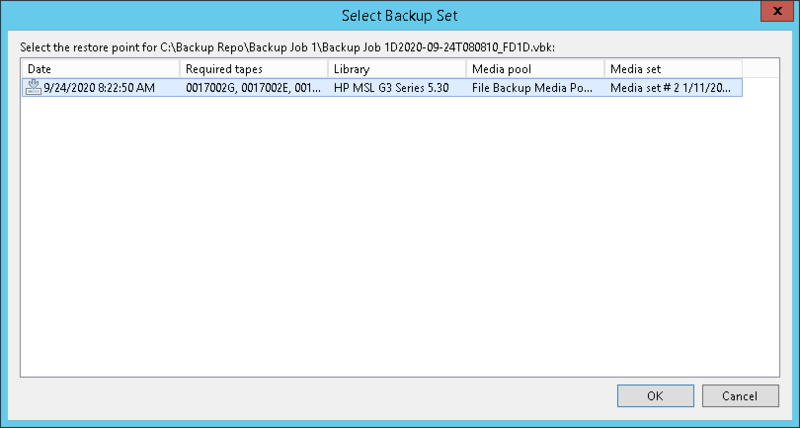 In the list of available backup sets, select the necessary archiving session and click OK. When you restore an entire folder from tape, Veeam Backup & Replication restores all files that have ever existed in the folder and been archived to tape. To restore files in the folder, Veeam Backup & Replication scans the selected backup set and backup sets that were created previously. If a file is not found in the selected backup set, Veeam Backup & Replication will restore the most recent version of the file from a backup set preceding the selected backup set.